For some reason, I've kept a bag of button for the past twenty years. 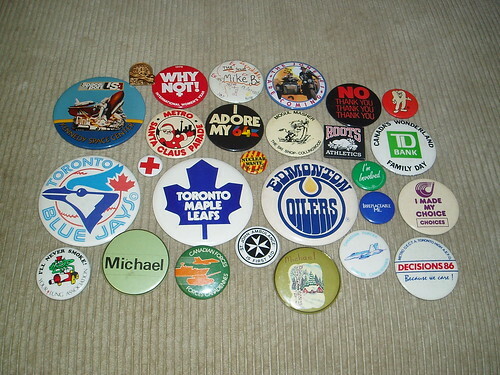 It's not a particularly large collection or special collection, it's just 27 buttons from my youth. Three are buttons with my name on it, one is to celebrate Toronto's 150th birthday, a few are to celebrate sports teams I rooted for at the time and the others range from an "I Adore My 64" button to a pledge that "I'll Never Smoke!"